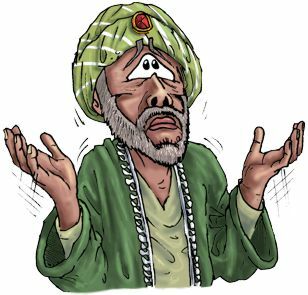 Bible Cartoons: For crying out loud, ACT! Do the actions I take today demonstrate my faith & trust in God, that he will provide for my needs? What does that story/metaphor mean? I don’t know about you, but I don’t have a field! I’m not a farmer; I don’t plough & drill seed into it either. 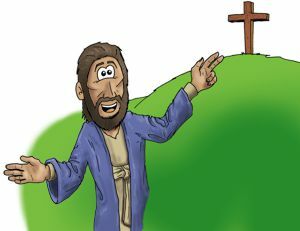 I’m a Bible artist; I draw Bible Cartoons (BC). I design BC products & merchandise. I have a website. I’m interested in selling my work & getting it used by as many people as possible. I want to encourage people’s Christian faith via the website & work I produce… so what’s all this talk about “fields”, “farmers”, “field preparation” & “rain” got to do with me… or you, in your situation? Taken as a METAPHOR, the “field”, “farmer”, “field preparation” & “rain” represents something different for each person who comes across that story. So what does this story/metaphor mean to you, in your situation? And me, in mine? It would be so easy to concentrate on the “field”, “farmer”, “field preparation” & “rain”, & MISS the point of the story. Remember, BOTH farmers PRAYED for rain, but ONLY ONE went out & prepared his fields. The significance of that is ACTION. The 2nd farmer TRUSTED & BELIEVED that God WOULD send the needed rain. Armed with that assurance, he went out & ploughed, raked & drilled his fields with seed. That’s FAITH IN ACTION. Imagine all the other farmers round about, looking at the parched landscape… all their collective fields waterless & lifeless. Then they see their neighbour raking up the dry soil & planting seeds – madness! All the other farmers would probably have laughed to themselves as they watched the farmer “waste” all his precious seed in the process. They didn’t want to waste their seeds in such seemingly fruitless planting. “With no rain those seeds will never sprout!” they’d have laughed. It was the SITUATION that would look so funny to the other farmers: planting perfectly good seeds into barren, lifeless, water-less soil. Now that’s funny! That 2nd farmers’ seed planting activity would look pretty silly… until the rain started! Then all the other farmers would have wished THEY’D have had that much faith. The point is, the farmer who sowed his seed into his field BEFORE a single drop of rain fell, DEMONSTRATED his faith in God’s ability to send the needed rain. The farmer put his faith on the line & drilled the seed, BEFORE the rain was sent. Thus he ACTED on his faith, where the other farmer(s) did not. As James says in chapter 2 of his letter, “…faith by itself, if it is not accompanied by action, is dead” *1. So it is by our ACTIONS that we show WHAT WE TRULY BELIEVE. That is true for Christians, people of other faiths, & people who profess to have no faith at all. Everyone demonstrates what they truly believe by the actions they perform. We may confess all sorts of words. We might say we trust God, or that we “know” he will do this or that for us. But what we really believe only ever comes out (is demonstrated) by our ACTIONS. They show what we REALLY believe, in the core of ourselves. That reminds me of Noah & the building of the ark (Genesis 5:29-9:29). Here was a guy who decided to build a great big ship… in the middle of a desert! That must have looked pretty silly to everyone for miles around. All about must have snickered to themselves as the huge wooden ship gradually took shape before their eyes. It wasn’t so much the building of a massive wooden ship that caused all the laughter. It was the SETTING or surroundings that did that. Building a ship is not particularly funny, but building a ship in a waterless desert is! It was the SITUATION that caused mirth. When the ark was finished, stuck in the middle or that arid, sandy place, everyone must have chuckled… until the rains came & the earth’s cisterns spewed forth water. So it was that Noah PROVED his faith BY BUILDING the ark. Noah’s ACTION lined up with his faith in what he believed God told him to do. What is impressive in the case of the 2nd farmer in the “Facing the giants” DVD & in the story of Noah, is the expression of faith BEFORE the end of their story. Anyone can have faith when the rains actually arrive. What is DIFFICULT is having faith when you’re looking up into a waterless sky. What is difficult is building something (planting a field; building a ship, whatever) BEFORE you get the breakthrough. It’s at that point (BEFORE the rain comes) & when everyone’s laughing at you, that your faith is REALLY tested. It is so easy to give up; to agree with the masses; to acknowledge the critical “voice” inside; to “go with the flow” of unbelieving people surrounding us; to maintain the status quo. The Lord calls us to have faith IN SPITE OF the circumstances that we face. That’s the hard bit! But it is not impossible, just a challenge! Non-Christians often say “I’d believe in God if He appeared to me” – yes, of course you would! But that wouldn’t require any faith… that’s the point! “Seeing is believing” is an oft quoted phrase, but it’s DEAD WRONG. What we actually see is only a tiny, miniscule amount of the totality of what is “there”. By limiting ourselves to only believing what we can see, we restrict ourselves to the most basic, most simple, most obvious “stuff”… & we miss the true beauty & astonishing scope of the unseen universe: the total reality of all that is actually there. I expect the title used for the film “Facing the Giants” is a play on words. 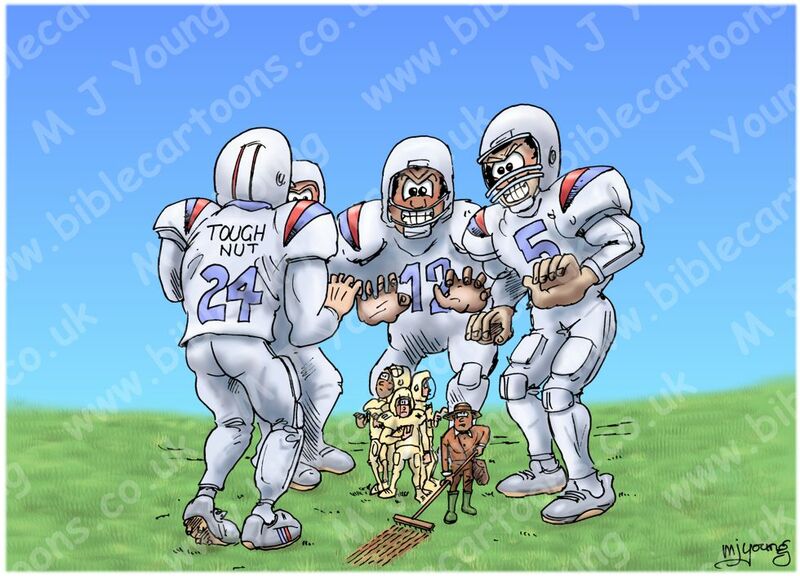 At the end of the story the “Eagles” team faces the “Giants” in the final American football game. I imagine it is a reference to the story of David & Goliath from 2 Samuel, where the little shepherd boy faces his own giant, Goliath, the soldier & hero of the Philistines. Whilst the Hebrew army saw Goliath (& shivered in their ranks!) David looked “beyond” Goliath to the infinitely larger & more powerful Almighty God of heaven. Compared to him, Goliath was nothing to be afraid of! The lesson there is to keep your eyes fixed on the God of heaven, in order not to be overwhelmed by earthly opposition. Back to the story of the farmers… & us! What about us… will we believe? So, what about us? What actions are we taking today? What is the Lord God telling us to do? And will we do it & so prove our faith in the process? As the rain falls on the farms, imagine what all the unbelieving & faithless farmers would think & realise. I expect they would see the gulf between their tiny faith & the gigantic faith of the farmer would DID plant his seed before the rain fell. As a Christian, to see someone step out in faith like that farmer is wonderful. But it is also quite a challenge to our (perhaps) small faith too! It can be so easy to chide ourselves (& believe the accusations of the Devil too!) 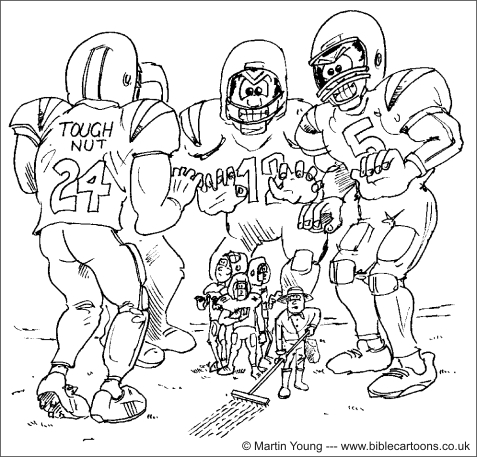 that we “ought” to have had more faith in “facing our own giants”. The good news is this: whilst there is life, there is hope. You & I may not have exercised our faith particularly well today. But the Lord God is SO AMAZINGLY generous: EVERY (new) day He offers another chance to step out in faith & believe BIG! Yes, when the rains came, THEN all the other farmers would have wished THEY’D have had as much faith as that 2nd farmer. And the GREAT news is, following the rains, they may well face another arid period, some time later, & find themselves given a 2nd chance to put their own faith into actions. That’s true for us all; all of the time; as long as the breath of life is within us. So my question is this: Has God told you & me to do something that sounds “mad” or “ridiculous” because of the surrounding circumstances today? And are you going to do it? If we step out in faith, He will meet us. God LOVES us; and God loves our steps of faith too! It’s not easy, but is rewarding. That may be true – hey, I know I’m no literary genius! But I have faith in my heavenly Father & THAT’S what counts. And I want to ACT on my faith & “step out in faith” by DOING something about it. My faith is to draw & write & publish & let God use that stuff any way that He chooses to. So even if no-one ever does read this blog, I will KNOW that I have acted on my faith & trusted in my God, & that makes all the difference to me (& us) in the world! This is the second time that I’ve read this in only 2 months. I think can assure you that you did not do this in vain. I’m still trying to work out when/how to bring this to my local Church as it is VERY pertinent at the moment.